The key to successful establishment of nursery stock is to transplant high-quality plants using good planting procedures and planting the right tree in the right place. Stress and physiological disorders can often be traced to improper planting practices and poor species selection. Many tree planting traditions have been passed down through generations in the landscape and arboriculture professions. Although some of these techniques are still recommended today, others have been modified to reflect research findings and technological developments. 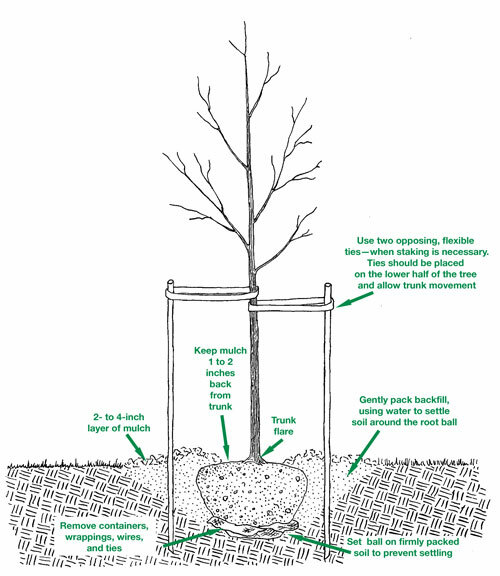 Planting trees and shrubs in the spring helps to promote better establishment. The plant benefits from being in the ground earlier in the season and can then begin the process of growing the roots it needs to survive.